Leading Manufacturer of bulk milk cooler and milk cooler from Ahmedabad. The most important part of a collecting centre of milk is the Bulk Milk Cooler (BMC). When the milk is extracted, it is at around 37°C. If the milk continues to remain at room temperature after extraction, bacterial growth will affect the quality of the milk. The BMC is meant to cool the milk to 4°C in a prescribed time. 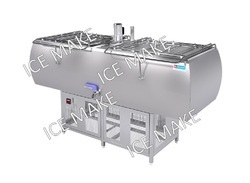 The BMC is available in different shapes and sizes depending on the amount of milk to be cooled and the system of cooling. 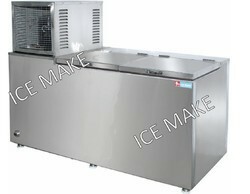 We are among the reputed manufacturer and supplier of Milk Coolers (Open Type Coil) that are widely used in dairy industry. We undertake bulk orders and promise to make delivery on time. Very best milk storage unit in the rural India. Just run our water cooler unit for 4 hours and then if power goes off, you can store milk up to 8 more hours due to water inside the Cooler Tank which keeps milk cool for long time. Even there is big problem of electricity and frequent power cuts, customer/user can place ice around milk cans stored in milk cooler. Due to the high density PUF and advanced technology, customer can store milk longer.